The DVD Review and Extras Review are by Dan Heaton. Image Transfer Review: Scorsese uses the color palette in an ingenious way to show the passage of time, tying firmly into Hughes' passion for film making. The first part of the film, starting in the 1920s, is shot with orange and aqua colors dominant, in a passable imitation of the appearance of 1920s and early 30s two-strip Technicolor. But in 1935 (contemporary with Becky Sharp being released), the screen suddenly explodes into a full-blown three-strip Technicolor explosion of marvelous color. That technique is faithfully reproduced in the HD DVD, and one can't fault the first part for the orangish skin tones. That's obviously intentional. There's very little grain visible, which makes one wonder if digital noise reduction was applied. If so, it was done sparingly because fine detail is still quite good. The dogfight sequences during the shooting of Hell's Angels have a nice 3-D effect. There are a couple of minor issues: a bit of edge enhancement is visible during the test flight of the aluminum plane, and some posterization is visible in the stylized skies during other test flights. These are fairly minor complaints, however, and on the whole this looks very nice indeed, with very good textures and plenty of fine and shadow detail. Audio Transfer Review: The DD+ track has reasonably good directionality, and the sound of the flight sequences is often unsettling. The clarity of quieter moments is where the disc really shines: the quiet crackle of the fire during the dinner with Hepburn's family is amazingly realistic. Howard Shore's score has a lovely soaring feeling that corresponds to the themes of the film, and it has solid presence without being obtrusive. The period music sounds first-rate, with the Glenn Miller rendition of Moonlight Serenade having an audible clarity I've never heard on it before. Extras Review: Only the trailer is presented in high definition. 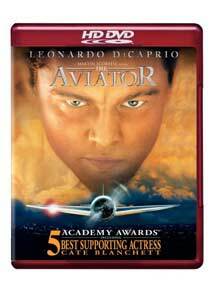 The Aviator earned 11 Oscar nominations and received honors from numerous critics as one of the year�s best films. While biopics can easily offer the typical conventional scenes, Scorsese and writer John Logan avoid nearly all of these pitfalls and deliver an original picture. Packaging with an impressive collection of extra features, this release deserves a high recommendation, and it comes across in spectacular beauty in this HD rendition.